Here's a trick forsanding wood floors, that you can use for refinishing oily, sappy or gummy wood flooring. Before I begin, here's a list of common hardwood flooring species that falls in these categories. These are the most common hardwood flooring used today. The common wood floor refinishing problems with these hardwood floors. Oily and sappy wood floors will clog your abrasive, which makes it difficult, and time consuming to refinish. Gummy wood are difficult or requires a lot of work and effort to achieve a smooth wood surface. When your refinishing hardwood floors, these types of flooring, will cost you time and a lot of money in abrasives. What is the easiest way to deal with this problem? For years, when we were refinishing wood floors. We would repeatedly go through abrasives or spend a whole lot of time working to get a smoother surface. Not just flat but smooth. The cost would add up, and it was difficult to stay competitive with the extra cost, when bidding on jobs. We stumbled on the solution to the problem, when refinishing a parquet wood flooring. implementing the wood floor refinishing method towards other types of wood flooring. We all know on parquet flooring the wood strips are laid in many different direction, to achieve a specific design for that type of parquet wood flooring. So the best way to refinish a parquet flooring is with a disc sander. You can use a square orbital or something similar, these are normally time consuming. That was it, all along it was something we were already doing. Here's a tip that you can use when your refinishing these types or similar types of wood flooring. Use this wood floor refinishing method, if, you are trying to achieve a natural finish, only. Whether it's with water base, oil base, moisture cure or a tung oil finish. First rough out your wood flooring then make your final pass with a 50 or 60 grit using a drum sander and edger. If, you have a lot of heavy swirl marks along the edges created from the edger. Try using a maroon pad under your abrasive disc, otherwise, it may be necessary for you to do an additional pass with an 80 grit. The key to dealing with these types of flooring is a low Rpm. The lower the better. High rpm will generate to much heat under the paper, which will clog your abrasives. Plus, if the rpm's are to high, your abrasive doesn't get a chance to do any work. It does more rubbing than cutting. So the key to refinishing these types of wood floors is use low rpm's. Some wood floor refinishing tools have adjustable speed rates. These are useful, but will only do so much. The lowest rpm is still above 1000 rpm. We need to get lower. 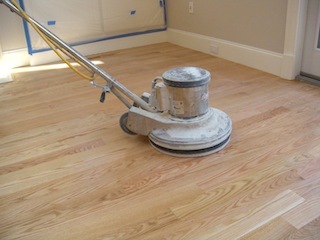 The best type of wood floor refinishing equipment to use is... a floor buffer. With the low rpm and the horsepower it has, the floor buffer won't generate too much heat to clog your abrasive, yet, has enough power to remove material, plus an 80 lb motor to keep it contact with your hardwood floors. So for your final pass, use a floor buffer and a 80 grit abrasive disc, when applying an oil base wood floor finish. Sand the entire floor with it. The buffer will give you a nice smooth surface, it will blend in your edging and drum marks. With it's circular motion, an 80 grit finish pass with a buffer will look like a 100 grit or better on a drum machine, when finished. You don't even have to screen the floor after your done. That's additional time saving and less pain on your back and knees from using the edger. Save the new 120 grit screen to buff the raised wood grain from the first finish coat, to get a smooth surface. Before, the final coat use a new 150 grit screen. This will help remove any bubbles or brush marks, that you may have missed, between the first and second coat. You can also use a maroon pad and 220 grit abrasive strips. For water base wood floor finishes, use a 100 grit abrasive disc, then screen with a 120 grit screen, before applying your coatings. If, you have an uneven floor surface, it may be necessary to sand these areas with and edger or palm sander with a fine grit abrasive. Keep in mind that all abrasive marks should be removed before applying your first coat of wood floor finish. Know the difference, when renting a hardwood floor buffer for a specific task. Buffing Disc - This disc has hard bristle attached to it, which are used to hold your buffing pad in place under your machine. Your screen is then, placed under your buffing pad. The function of the pad is to distribute equal pressure to the screen. Replace your pad, when the edge thins down or it does not keep the screen underneath the buffer. Use a buffing disc to apply stain, clean, or surface abrading between coats (light sanding). For screening between coats use either a 120, 150 grit screen or a maroon pad with 2 - 220 grit abrasive strips. Tip: To remove brush marks, bubbles, dirt, hair and fiber. Buff with a new 150 grit screen, then use 220 grit abrasive strip to remove 150 grit buff/swirl marks. Sanding Disc - This disc has a soft padding and uses a 4" washer with bolt to hold your sandpaper in place. Use either 80, 100, 120 grit abrasive disc for finish or light sanding. Use a sanding disc to resurface parquet style wood flooring. Although not needed, for a really smooth surface buff with a 150 grit screen after your finish pass. 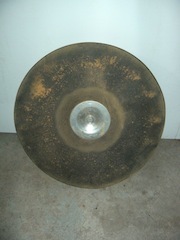 Although, 36, 40, 50, and 60 grit disc are available. I recommend using a drum sander and an edger, for aggressive wood finish or material removal. The secrets out, and only viewers of this site will know this sanding trick that we use on oily, sappy and gummy wood floors. Don't just use this refinishing method on these types of flooring. If, your refinishing wood floors, this method works with all species. You'll be able to reduce your refinishing time, save money, and get high quality results, when refinishing hardwood floors. Visit our photo gallery, to see our quality work.